This time of year thoughts turn to falling leaves and chilly nights, making it just one baby step away from the next thought; namely, the radiators and/or heating systems in your home. Are your radiators functioning properly? Do you know how to fix a radiator leak, should one occur? Before the cold sets in, turn your heating on for short periods. Radiator products and supplies can help fix most leaking problems, but in order to avoid them (the problems, not the products and supplies) radiators should be tested during the year and inspected and maintained on a regular basis. 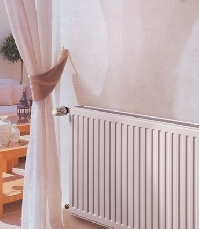 There are many problems that can befall a radiator, one of the more serious involving unattended leaks. Some minor problems can wait, like too much noise for example, which can mean ta surplus of air is trapped somewhere or that the valves are not properly closed. Leaks, however, wait for no man or woman, and if left alone can cause extensive damage to floors, carpets and walls. How can you fix a radiator leak? Knowing how to fix a radiator leak depends on the source of the seepage. Below is a list of some trouble spots and how to fix them, most of them involving the help of some reputable plumbing and heating supplies. If a valve is leaking, you must dry the area around it carefully, and before replacing the valve make very sure that the leak is not occurring from a neighboring source. By pressing tissue paper around the various points, you can easily ascertain the source. This must be done as water can easily run around and drip, making you think that another area is the cause of the leak. If the leak is coming from the spindle (the rotating part that opens and shuts the valve) use a crescent wrench to tighten the gland nut (which seals a shaft against liquid). If this does not stop the leak, try winding some PTFE tape also know as thread seal tape (which is cut to specified widths for use in sealing pipe threads) down into the spindle. If the coupling to the pipe is the problem area, how to fix a radiator leak may entail only the gentle tightening of the nut. If that proves unsuccessful, you will need to drain the radiator. Then undo the cap nut, take off the fitting and replace the olive, which resembles a wedding ring and is the pipe�s seal to the radiator. (The olive can only be used once and if the radiator has to be disconnected, it must be replaced or the leak will continue.) Either smear the olive with silicone sealant or wind some PFTE tap around it before re-tightening the cap nut. There is no hope of learning how to fix a radiator leak if the seepage was caused by corrosion. A new radiator must be fitted, but emergency temporary repair is possible via plastic resin filler. In order to replace the radiator, first turn off the valves at each end. Then remove the cap and fit the key on the top. Clean corrosion from the threads of both adapters by using some wire wool and wrap some PFTE tape around the threads. Make sure that the wall brackets are secure before replacing the radiator. Connect the valves to their adapters and prevent future corrosion by flushing out the new system with clean water and adding a rust inhibitor. Be proactive in detecting leaks by watching out for leaky valves before they become a real problem. Many times, just a simple tightening of the nuts and bolts is all that is needed, if you catch it early enough. Hopefully, you will not have to call a professional when you need to know how to stop a radiator leak, but one rule of thumb always applies. Remember that if you don�t know what you are doing, call someone to help you because it is ultimately better to be safe than to be extremely wet and very sorry.